In this video and article we will discuss the workflow and process of producing Kickstarter background music for a product trailer. You will learn many of my secrets in creating an emotional score. Watch the video below and get the additional details in this article. 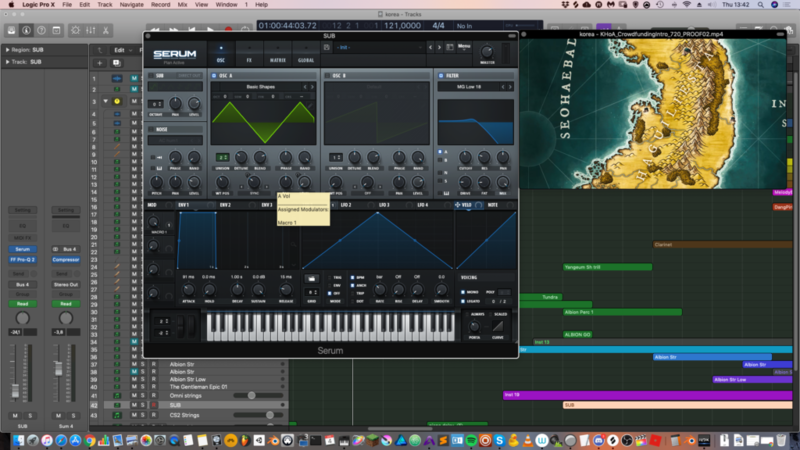 How to write Kickstarter background music for trailer videos. If you are impatient, you can also watch the final Kickstarter trailer here on the official Red Scales Publishing facebook page. I got a message the other day from an old friend of mine. A film director operating in South Korea named Aurélien. We have been collaborating on many films since 2010. I wrote the music for short films like; Call Coho, Fender, Sedae, I’Profess, Bag of Bones, Saede Chai etc. You can probably find reference to them on my imdb page. My friend runs a production company called AJP in Korea. 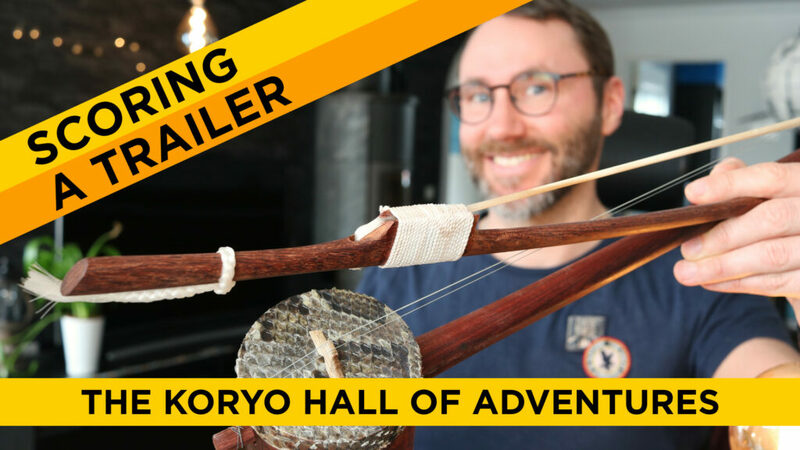 At the moment he is about to launch a Kickstarter campaign for his latest endeavour, The Koryo Hall Of Adventures. It was time for another collaboration in writing the score for his Kickstarter trailer video. I really liked the trailer video he sent me so it was time to pull up the sleeves and dig into the Korean culture. So how does a Kickstarter product trailer project begin? It all begins with the brief. He sent me a quick brief about the concept. A Dungeons & Dragons campaign with a strong Korean flavour in concept and culture. We discussed thematic material and instrumentation to really push for a Korean vibe. 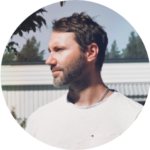 I’m from Europe, born and raised in Sweden and have very little knowledge of Korean culture except for the past films I’ve worked on. On some of the past films we have been discussing Korean instruments but rarely been strict on going all in. I received several videos of original Korean artists, instrumentalists, chanters and other good reference videos. Reference videos is really helpful if you are working in a territory not so familiar to your regular work expertise. The first thing I do after receiving a product trailer to score is to do a spotting session. It’s called spotting because you are watching the video and finding important places in the film. Cue points if you will. The spotting session is all about finding the tempo and also important points where you might want to enhance / lift the scene with the music. It’s all about telling the story. 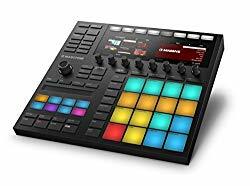 So to find the tempo, press play and tap your foot or a finger to see what tempo might suite the scenes. I write down, or in this case due to the small scope, make mental notes of important cue points in the trailer. There was this dark lurking demon in the background which was also hinted in the voice over. This dark creature was one thing that I wanted to lift in the score, but with delicate and subtle brush strokes. Big or small score for the Kickstarter background music? 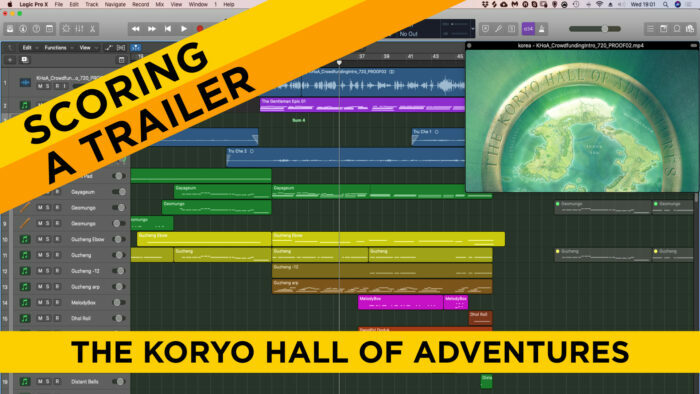 Since the Koryo Hall of Adventures trailer was a quite short trailer with tons of voice over throughout, I knew we had to keep the score in the background. Except for the ending part where we have the smashing logo and the grand finale. Firstly, the director requested the music to start at 24sec into the trailer. Secondly, we discussed keeping it quite small and delicate. The reference music (or temp music if you will) was very sparkling and flowing. Furthermore, in trailers you can either go full on Hans Zimmer orchestra with the Inception / Bat Man braams and epic booms. Or, you can go small and tight with a close arrangement to reach the heart of your audience. In conclusion, the animated and colourful imagery leaned toward a small light musical arrangement. There is a great collection of free sampled Korean instruments that are typical for the culture in the webpage of Center for Arts & Technologies Seoul National University. Aside from these I have a ton of other oriental sample libraries like Silk and RA from East West. 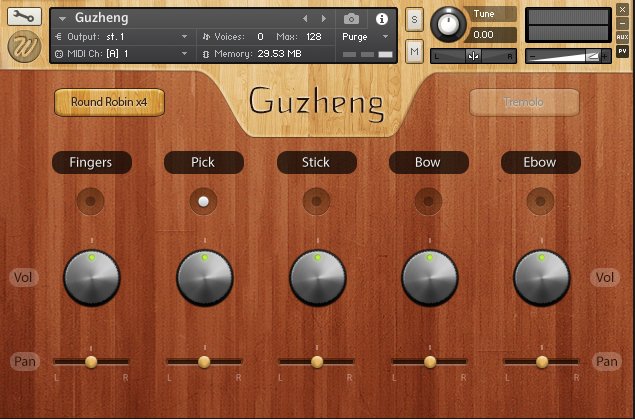 And I also have a deep sampled Guzheng with some interesting articulations like tremolo, e-bow and pluck. So when writing the motif and theme for the Kickstarter trailer music I used some of these instruments. Importantly, I began playing with the Korean instruments GeoMungo and GayaGeum to find the sweet spot where a melody would suit the instrument range and sound qualities. When the melody was defined I layered the tracks with various articulations and instances of the Guzheng to breath even more flavour into the melody. The wonderful Guzheng. Not the prettiest interface but the sound is, oh so lovely! The intro was arranged lightly with some wood wind and string patches played in con sardino (a muted / soft sound) from the Albion Tundra library. We lightly touch the theme and play the smallest parts of the theme, called motif. Then we slowly start to bring in the instruments and fill out the sound spectrum. Importantly, we gradually make the soundtrack wider and deeper in all axis. Later I bring in some more traditional orchestral strings (courtesy of Albion One and Cinematic Strings) to beef the soundtrack and give it a slightly more cinematic character. It’s a trailer, we need to have some cinematic spice. Speaking of cinematic. 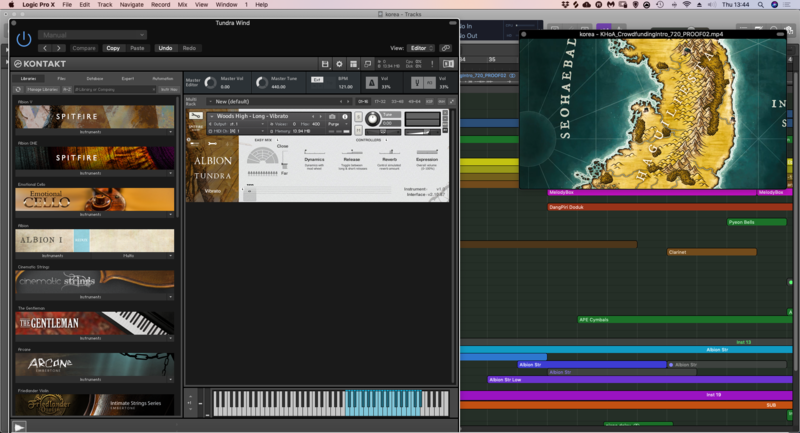 You can’t score a trailer without using the Omnisphere 2 vst instrument. 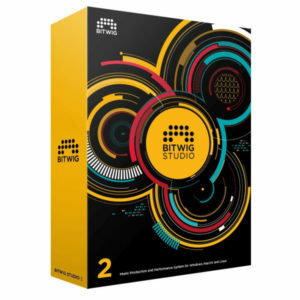 So I brought in Omnisphere and used this lush patch during the intro the enhance the brilliance of the con sordino strings. You can watch a video I did on this new updated Omnisphere 2.6 instrument. The extra layered Omnisphere preset consisted of a hang drum played with a toothbrush! Yeah I know it sounds silly. But it’s actually a very unique and wonderful sound and blended perfectly well with the con sordino wood wind and string arrangement during the intro. Sub bass patch created with Serum. After adding the Albion One 8va Cello patch to the last part of the arrangement I felt it lacked a little bit of low end. Again, it’s a trailer, we need deep low end. It’s like the final piece of the puzzle. I created a quick patch in Serum with dual oscillators of triangle waveform with a subtle pulse width modulation going on. I also gave it a tad of saturation. This patch acted as a sub bass pad and was layered below the strings and cello to give the low end depth of a trailer. Usually I go for a pure sine wave in the low end (sub bass) but sometimes it can also be suitable to go with triangle. While a sine wave is one pure fundamental tone, a triangle has upper harmonics. Importantly, this makes the sound come across better on small speakers. Hey, people watch trailers on the phones all the time these days. Now it was time to make the bombastic ending of the cue. I brought in some epic percussion from 8DIO, the Dhol. And an impact from Albion One. The rest of the track just had some light percussion like Korean Cymbals and bells. Importantly, for the end part we want to end with a bang. So the project was a wrap. Or so I though. But there was something missing. The director persisted we added some more nerve into the cue with a 2-string bowed instrument. Luckily I was on a trip to Cambodia a few months back and brought a Tru Che with me from the area. This is what the Tru Che, 2-stringed bowed instrument from Cambodia looks like. Apparently they have a similar instrument in Korea and so I wrote a soaring melody to give the cue some nerve. This kind of string scrubbing and scraping was heavily used in the Witcher 3 soundtrack. And it’s really a favourite of mine. So it was fun to bring this to the table. The project was finished and the trailer now had a suitable delicate score that would not fight against the dialogue / voice over. It was a quick and fun project and another customer satisfied. I hope you enjoy this article and video about the process of scoring this Kickstarter trailer. If you have any questions or want a score for your own game, film or Kickstarter please get in touch.